as usual. Perhaps on my next trip I will get more done – the International Urban Sketching Symposium this year will be held in Manchester and I do hope I can go. Early-bird Registration opens on January 30 ($415 though, may have to sell a few drawings first!) If I do go, I will try to organize another themed sketchcrawl in London on the weekend before, maybe on the Sunday. We will see. 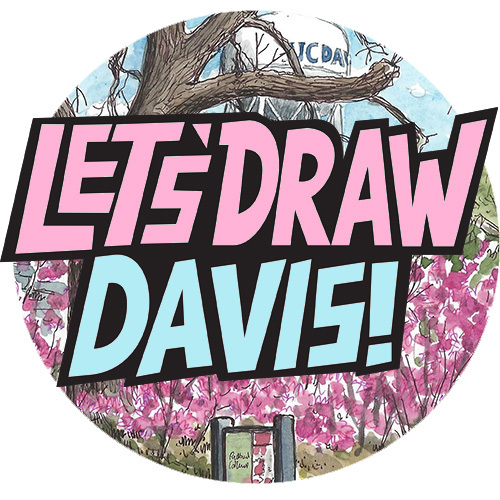 London Urban Sketchers are holding one on the Saturday before (they like to set out the year’s “Let’s Draw…” sketchcrawls in advance), so I’ll try not to clash. I do like a themed sketchcrawl, and back in 2014 I did organize one called “Sketching Wren’s City”, which went from the Monument down to St. Paul’s, taking in as many of Christopher Wren’s buildings (mostly churches) as possible. I provided everyone with a hand-drawn map and lots of information; it was immense fun, and we topped it off with a visit to the Old Bell Tavern on Fleet Street – also designed by Wren.You can see the sketches I did, and find out more about the sketchcrawl here. One Wren church we did not make it to (being just outside the City borders) is this one, St. Clement Dane. I used to pass by here every day when studying at King’s College, and it’s in an amazing location, on a traffic island at the intersection of Strand and Aldwych, just where the traffic turns to down towards Temple Station and the Embankment. Further down Strand behind me is another church on a traffic island, St. Mary-le-Strand, known to taxi-drivers as “Mary-in-the-way”. 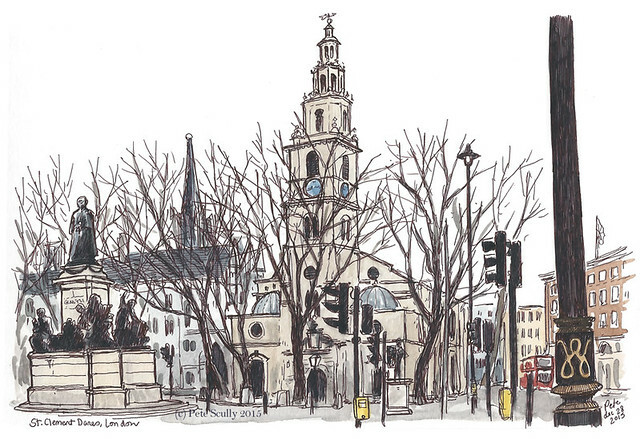 St. Clement Dane’s is more famous – its bells regularly play out the tune to “Oranges and Lemons”, after the nursery rhyme that mentions St. Clement’s, although it’s possible that the church in the rhyme is actually st. Clement Eastcheap. St. Clement Dane dates back to Anglo-Saxon times, and though the ‘Dane’ part of the name also dates back this far, it’s not exactly certain why, though this church was located at the very edge of the ‘Danelaw’, the large swathe of England ruled by the Danes. The current building, designed by Wren in the 1680s, was gutted by bombs in World War Two and restored in the 1950s. The large statue in front is William Ewart Gladstone, the former Prime Minister. Behind him are two more statues, of prominent Royal Air Force chiefs Hugh Dowding and Arthur “Bomber” Harris (unseen). This church has long had connections to the RAF, and contains many memorials to fallen airmen. Behind the church is a statue of Dr. Samuel Johnson, writer of the first English dictionary, who lived nearby off of Fleet Street. And just visible behind St. Clement’s are the Royal Courts of Justice. I stood on the edge of the traffic island and sketched, as the day started drifting away. Days are so short in London winter-time, and I had to get back for dinner. Goodbye London, until next time. You capture so much in your sketches. I tend to be distracted by pigeons! Cheers! I don’t see as many pigeons in London these days, not like the old days. When I was a kid they were everywhere, swarming around. In central London, big efforts by Ken Livingstone when he was mayor to remove them from public spaces like Trafalagar Square seem to have brought them down in general. Still a lot in the parks and by the river though. In my part of north London there seem to be fewer, along with fewer sparrows, but a lot more magpies. Hard to say though, i live in California now and we have hardly any pigeons in Davis (but loads of crows and blue scrub-jays). Thank you, if I go to Manchester I may need pointers! I’ve never been. all your art sketches are beautiful ..I am in awe of your talent ♥ thank you for sharing a piece of London with us through your eyes.